Lussuoso cottage recentemente ristrutturato con camera da letto principale in stile loft con vista spettacolare sul Lago Simcoe. Godetevi l'area unica piattaforma per intrattenere all'aperto in riva al mare o vieni dentro per apprezzare la cucina completa con barbecue all'aperto e sala Muskoka. Assicurati di pianificare una notte d'estate intorno al firepit. Scegli il tuo stile personale: un momento di relax su una sedia Muskoka sul molo che si affaccia su splendidi tramonti, o metti in primo piano le attività di quattro stagioni. Le avventure estreme nelle vicinanze includono: mountain bike, percorsi in motoslitta e ziplining. Oro-Medonte è una grande area per gli amanti dell'outdoor con eccellenti opportunità per la corsa e il ciclismo. Le attività invernali includono la pesca sul ghiaccio, escursioni in motoslitta e la discesa e lo sci di fondo nelle vicinanze. E tutto a solo un'ora di strada da Toronto. An absolutely amazingly relaxing weekend!!! This property is so gorgeous, so clean and so luxurious, the owners are the embodiment of privacy and welcoming, the front lake view is to die for and the location entirely is absolutely fantastic. We've yet to have a more relaxing weekend at a cottage, and we've been around cottage life for sometime now. Congratulation to the Fishers and a very big THANK YOU!!! We hope to see you again soon! Strongly recommend this property!!! Lovely home, very clean, with every convenience. Krista provided delicious homemade cheese biscuits, with a jar of homemade jam on our arrival, which was very welcoming. It was our pleasure to have you and your guests at our cottage. Wishing you safe travels in the upcoming weeks. So glad you could come and relax at our cottage. Thanks for your visit. My family had a wonderful stay in Oro-Medonte. Krista was a gracious host with many recommendations for activities in the surrounding area. The home was immaculate, comfortable, spacious and exceeded every expectation. We had a very relaxing getaway. Thank you, Krista! We will be back. Thanks so much. It was our pleasure to have you in our cottage and to know you had a wonderful holiday. Looking forward to when our paths will cross again. Absolutely perfect getaway. The house, location, and owners hospitality was beyond expectations. Fantastic quiet location and a lovely house, exactly as pictured, with everything you could need for a relaxing vacation. We stayed over Christmas and arrived to find the house beautifully decorated in Christmas trimmings, including a tree. The house was so warm and cosy and the owners, Krista and David, could not have made our stay any more perfect. It was a pleasure to welcome you and your family to our home and neighbourhood. We are glad you had such a memorable stay and would look forward to seeing you again. Krista and David has been very prompting with response and service throughout communications and our stay! 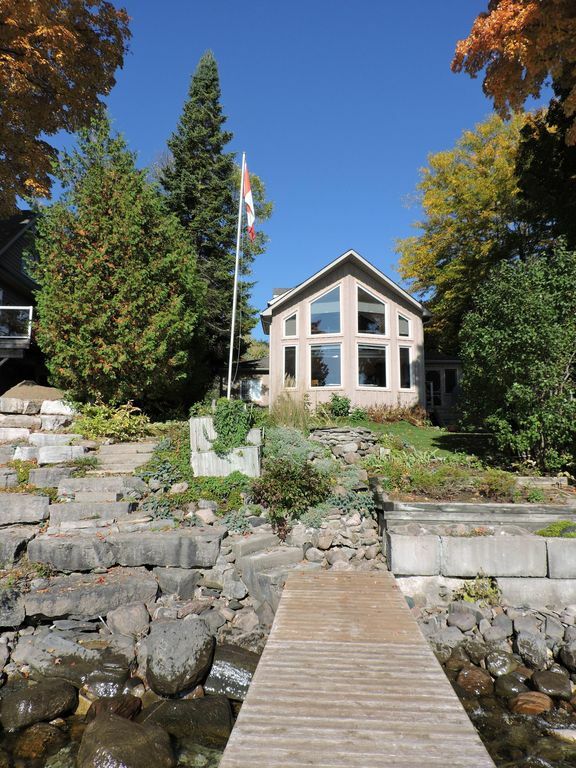 Cottage has amazing lake open view with clean environment. We regret that we didnot book for the entire week, but only weekend! We definitely want to come back often to spend our weekend! Thank you Krista & David! Thank you for your kind review. It was our pleasure to have you as guests. Looking forward to seeing you anytime. Vicino a molte attrazioni tra cui Casino Rama, Horseshoe Valley Resorts, Moonstone Mt. St. Louis Ski Resort, Burles Creek Event Center, Sunset Drive-In Theatre e Hardwood Hills.